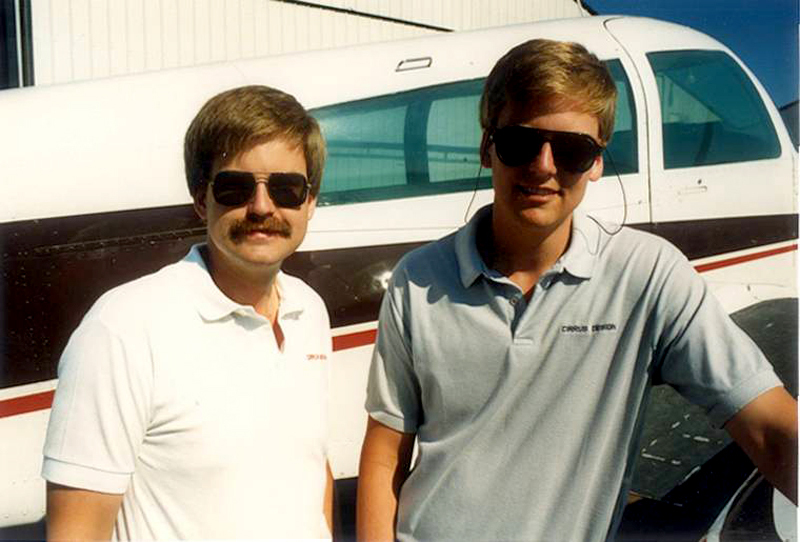 Dale (left) and Alan Klapmeier, in front of Cirrus aircraft parked outside the company’s plant in Duluth, Minn., co-founded Cirrus Design Corporation. For brothers Alan and Dale Klapmeier, their aviation passion has served as the mother of invention. 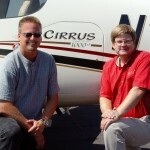 Alan founded Cirrus with his brother, Dale, company vice chairman. 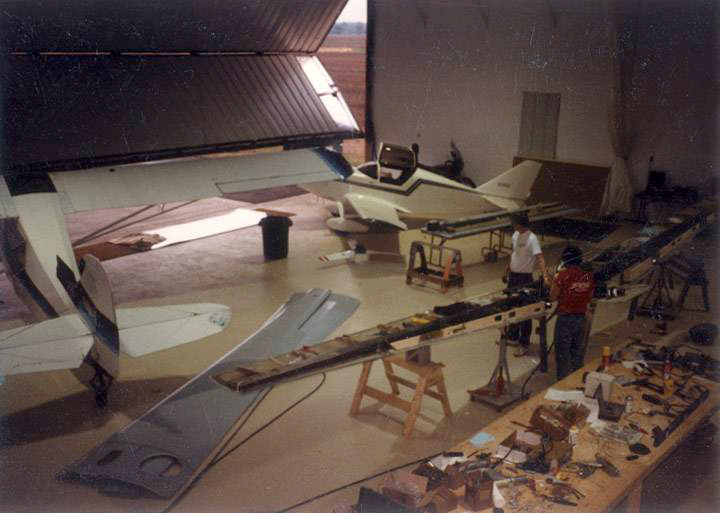 After building a Glasair kit aircraft in the early 1980s, the brothers built a kit aircraft of their own design, the VK-30, in their parents’ barn. In 1984, they formed their company. Today, the siblings manufacture FAA-certified, composite, four-place, single-engine piston and turbo-powered aircraft. When Cirrus Design’s first FAA-certified SR20 airplane appeared on the scene in 1998, it was described as futuristic—a sleek-looking design that had a parachute. No one knew what to make of the aircraft. From the start, Cirrus had designed its aircraft around technology that didn’t yet exist within the general aviation industry. Behind the scenes, for the most part, Cirrus funded the R&D for a glass cockpit, working closely with avionics manufacturer Avidyne. 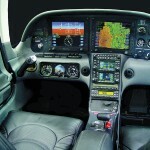 In July 2002, Cirrus announced its all-glass cockpit, which first became available in its second model, the SR22. In 2003, the all-glass cockpit became standard on all its airplanes. The GA industry has largely adopted the Klapmeiers’ all-glass cockpit design, which captures buyers from around the world. Other manufacturers today are starting to contemplate the idea of installing life-saving parachute recovery systems. Today, as one of the world’s largest manufacturers of aircraft in its class, Cirrus is one of the great success stories of modern aviation. What the company has been able to pull off since its first aircraft delivery eight years ago is an incredible feat. Before the SR20 became certified, few in the industry believed the brothers could design, certify and produce technically advanced aircraft. In fact, many scoffed at their ideas. For their intense spirit of exploration and sheer devotion to making the GA industry safer and a more interesting and thrilling place for all of us, Airport Journals is proud to honor Alan and Dale Klapmeier as our 2006 Michael A. Chowdry Aviation Entrepreneur of the Year Award recipients. Alan Klapmeier was born in October 1958, to Larry and Carol Klapmeier. Dale joined the family in July 1961. Aviation entered Alan’s life early. His parents often told him that he was a “very needy baby” who cried a lot. His mother came up with a great solution. He says he and his younger brother have always been fascinated with airplanes—something ingrained into their souls by their own volition. “Whatever the toys that kids had in 1959 and 1960, mine would have been airplanes,” he said. From an early age, the future aircraft designers and manufacturers made airplane models, but at that time, they took the easy route and purchased store-bought kits. The boys fantasized about flying the real thing. “This was during the period right after ‘The Great Waldo Pepper’ came out,” says the model plane destroyer, referencing the 1975 memorable barnstorming movie starring Robert Redford. Alan rode his bike past the airport, to check out the “cool looking airplanes” that had landed each day. He recalls that as adolescents, he and his younger brother also discovered a passion for racing. In the early 1970s, their parents bought a family vacation farmhouse in North Freedom, Wis., about 10 miles southwest of Baraboo. Now, with enough space, the brothers managed to get some mini bikes. Dale says he suspects his parents thought he and his brother would eventually lose interest in their need for speed. Alan recollects the moment in his life when aviation “really” inspired him. 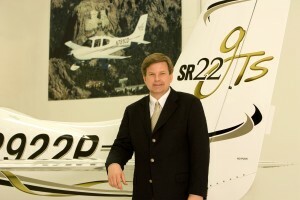 Alan Klapmeier flies coast to coast in his SR22-GTS. He still has that magazine. Dale recalled picking up a copy of Flying Magazine that featured the Bede Aircraft BD-5, a single-place, sporty, high-performance kit plane, introduced in the early 1970s. “I remember going up to Dad and saying, ‘Let’s build an airplane!’ He looked at me and said, ‘Are you out of your mind? '” he laughed. His older brother also recalled that day. “As he was laughing, Dad said, ‘My kids are insane! '” Alan smiled. While in the high school band, Alan became acquainted with Ernie’s friend, Scott Ellenberger. The two trombone players connected right away. Ellenberger, who was a year older and already had his driver’s license, would drive Alan past the airport. Completely smitten with aviation, Alan joined the Civil Air Patrol while still in high school. Alan began taking flying lessons at the beginning of his senior year, while his younger brother began lessons when he was 15. Their father had a 1960 Cessna 182; later, he bought a 1981 C-Skylane 182 RG. When the two brothers decided to buy their own aircraft, Ernie joined them, and together, they bought a 1947 Cessna 140. (Today, Ernie buys and sells old military equipment). Alan graduated from Ripon College in 1980, with degrees in physics and economics. In December 1983, Dale graduated from the University of Wisconsin Stevens Point, earning a degree in business administration with an emphasis in economics. Dale says that when he went to college, he didn’t have a clue what he would study. Alan Klapmeier works on the brothers’ kit airplane, a VK-30, in their father’s garage. The two built the airplane more than 25 years ago, while living in their family farmhouse in Wisconsin. In 1979, the brothers bought a wrecked 1960 Champion 7-GC, which they rebuilt. Dale says that experience really turned him on to building airplanes. They worked on it in a shed at the farm. Larry Klapmeier had just built a garage onto the farmhouse, and his sons had promised not to bring airplane parts into it. However, when the shed was overrun with parts, the brothers moved to the garage. “Mom and Dad were gone for a couple of weeks. Alan and I planned to use the garage while they were gone, and get out before they got back,” Dale laughed. They believed they could rebuild the Champ in one summer, but it took two and a half years. In 1980, during EAA AirVenture Oshkosh, they bought a Glasair kit from Stoddard-Hamilton. The aircraft was a two-place, side-by-side composite taildragger. They took delivery of the plane in 1981. 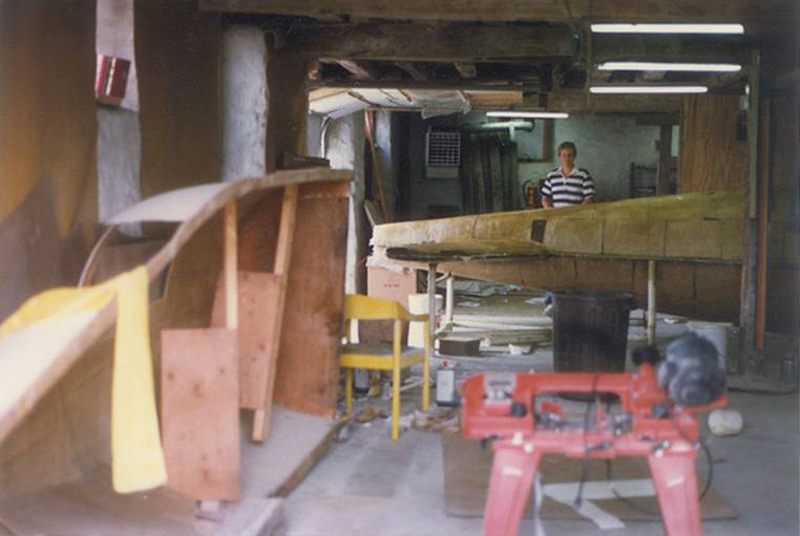 After outgrowing their parents’ shed and garage, they finished the plane in the farm’s barn. 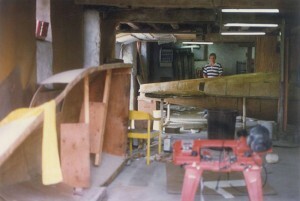 The Klapmeiers flew the Glasair in the spring of 1984. While Alan was still in college, the brothers continued to talk about going into business together. When they did decide to form their company in 1984, they included Alan’s college roommate, Jeff Viken. That year they had finally flown their Glasair, and had begun working on their own airplane design, the VK-30. “We had drawings of the VK-30 five years before that,” Dale said. The VK-30 was a composite pusher, with conventional wings and tail. It would eventually be the first kit aircraft featured on the cover of Aviation Week and Space Technology. Dale said they liked the pusher design for a number of reasons. Alan Klapmeier is in the lower level of the farm’s barn, where they began work on their VK-30 in 1984. “That also meant the airplane had better visibility,” Alan said. In 1985, they cut the first parts for the VK-30 fuselage. The brothers moved into the farmhouse to be closer to their project. Later, they built a hangar on the farm. The brothers and Viken had formed Cirrus Aircraft Corporation as an exploratory company. 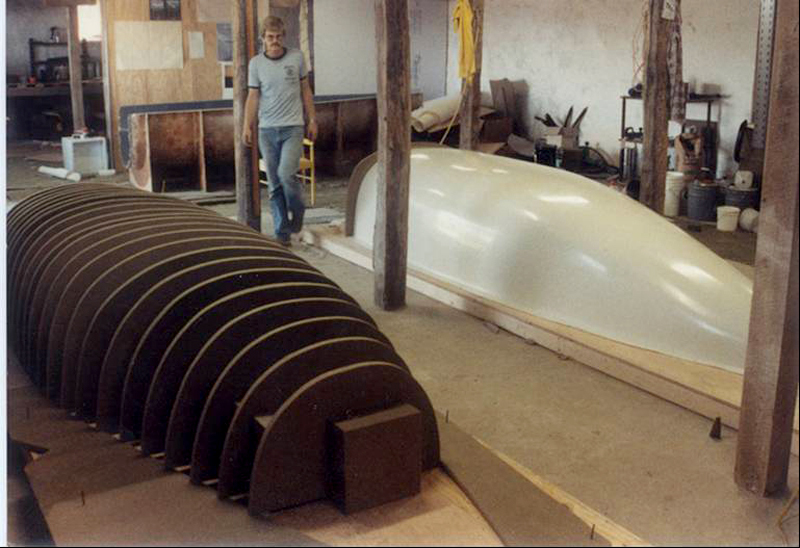 In 1987, its successor, Cirrus Design Corporation, was formed in Wisconsin. Viken and his wife, Sally, left the company in 1988. Dale says that their parents—who were shareholders in the original company—are probably relieved, now that Cirrus is successful. “I think ‘relieved’ is probably the right word, given how many times we had to go back and ask for money to help cover payroll,” Alan laughed. These days, their parents are definitely proud of what Alan and Dale have accomplished. Dale smiles when he thinks about his parents’ involvement. Alan doesn’t totally agree with that statement. Alan remembers how “Cirrus” found its way into the company name. Back in the early days, Dale Klapmeier checks the decal on the VK-30. Dale has a different recollection. Although it’s long been forgotten who was driving, the brothers agree on one important detail. “We agree that we were sitting in the truck, wishing we were flying,” Alan said. 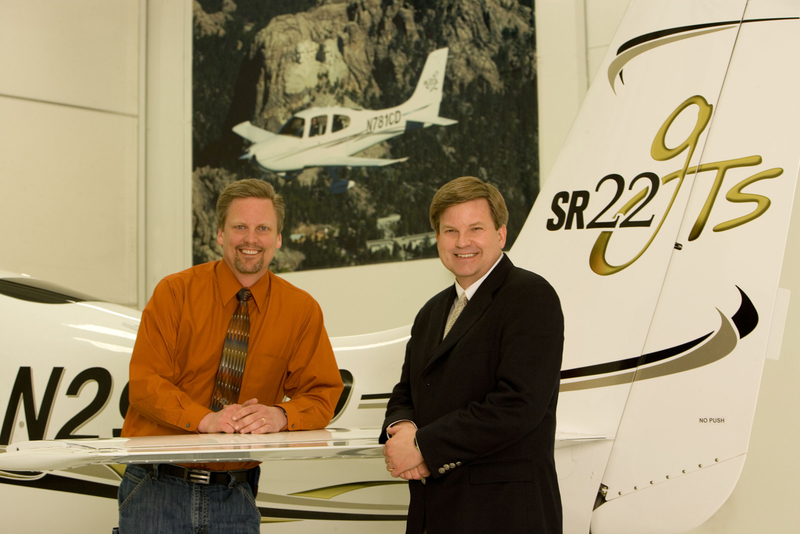 In 1994, the brothers moved company headquarters to Duluth, Minn. At the 30,000-square-foot research and development facility, they began work on the SR20, a four-passenger, single-engine, piston-powered, composite aircraft. That same year, Congress also passed the General Aviation Revitalization Act, renewing the single-engine piston market. Cirrus leapt into a new frontier, competing with aviation giants like Cessna. 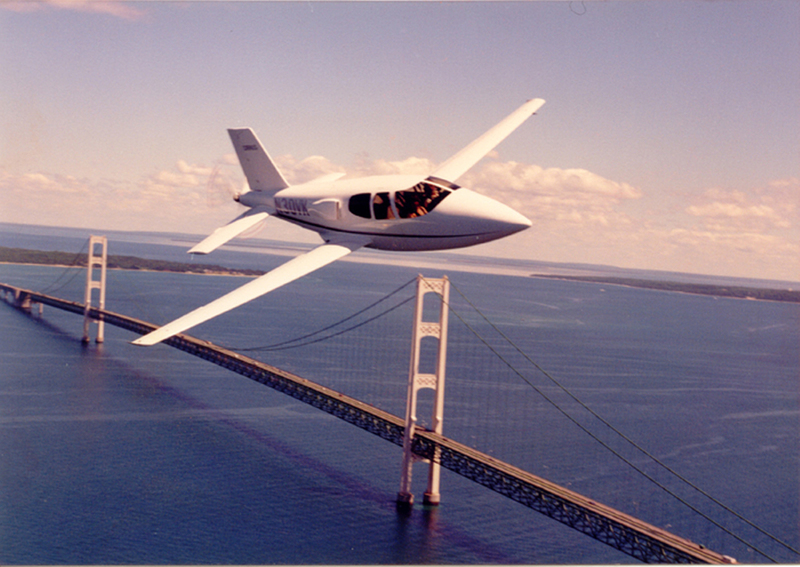 The first prototype of the Cirrus SR20 made its maiden flight in 1995. The following year, the company broke ground on a 67,500-square-foot manufacturing facility in Grand Forks, N.D. 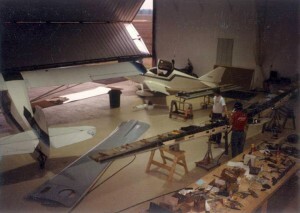 In 1997, Cirrus started assembly of its first production prototype aircraft. In 1998, the company moved into an 111,000-square-foot manufacturing facility, adjacent to its R&D facility and headquarters in Duluth. In 1999, the same year that Cirrus made its first customer delivery of an SR20, the company began work on the SR22, a four-seat aircraft with a 310-hp engine. Four years later, the company introduced the VFR-only SRV at EAA AirVenture. With a base price of $199,000, the SRV is the company’s lowest priced aircraft. 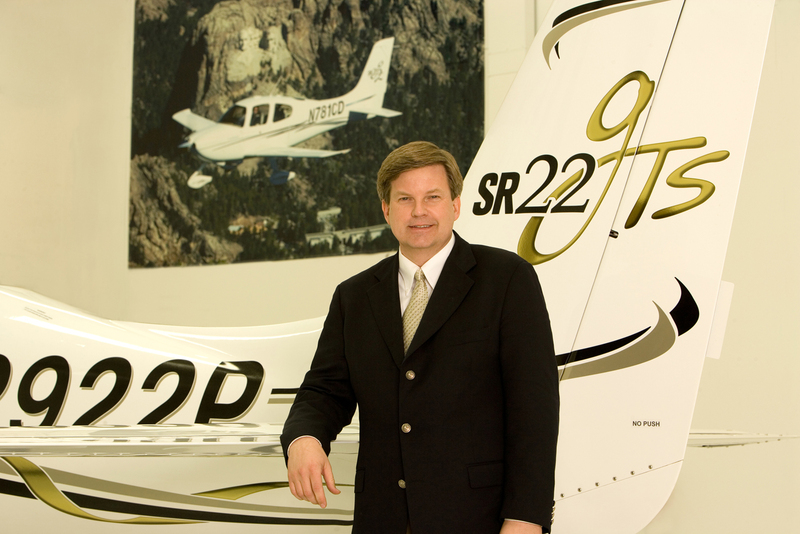 The same year the SRV was introduced, Dale purchased the company’s 1,000th production aircraft—an SR22. The company celebrated its 3,000th production aircraft in November 2006; Alan owns that SR22-GTS. That model later underwent a retrofit with a turbocharged engine. 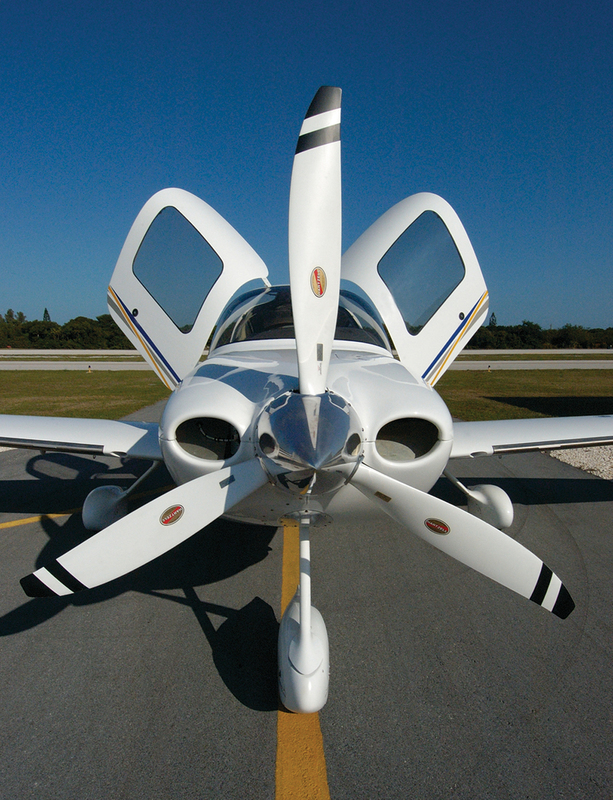 The SR22-GTS Turbo, the company’s newest aircraft model, was FAA-certified November 2006, with a supplemental type certificate. The brothers moved into the family’s farmhouse to be closer to their project. They later built a hangar on the farm. “It’s our highest performance airplane,” Dale said. 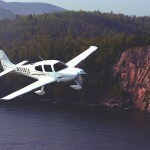 Cirrus manufactures 15 aircraft per week in its 250,000-square-foot manufacturing plant in Duluth. That facility is adjacent to what the Klapmeiers affectionately dubbed the “Moose Works,” a 20,000-square-foot research and development facility. Cirrus also has a 153,000-square-foot facility in Grand Forks, N.D. and additional facilities in Hibbings, Minn. The brothers formed parent company Cirrus Industries Inc. in Delaware in 1996, as an umbrella over all their burgeoning enterprises, and for the first time, they brought in outside investors. Cirrus Industries’ related companies include Dakota Aircraft Corporation, Aileron LLC, Cirrus Finance Company, Cirrus Insurance Agency LLC, the Jet Company and Aerospace Capital Group. Competition is fierce, but the company’s sales numbers speak for themselves. Cirrus delivered 600 aircraft in 2005 and about 700 in 2006. In 2001, Cirrus captured 11 percent of the market for single-engine piston planes. Today, the company holds a 33-percent share. Even those healthy numbers don’t reflect the aviation market that Alan would like to see. Dale says Cessna is still the “big dog” in the industry. According to Dale, the company’s biggest competitors are the companies competing against the industry for what people do with their money. Cirrus also must compete with companies that offer alternatives to flying. It’s certainly not amazing that the SR22 is one of the most significant contributions to modern aviation. Alan says the overall look of the airplane is modern and practical, but Dale describes it as conservative. With its range of 800 nautical miles, the SR22 is useful for almost any business or leisure traveler, including Alan Klapmeier. 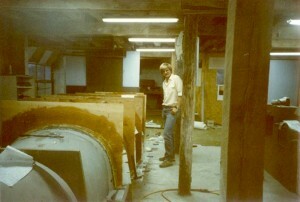 A young Alan Klapmeier toils in the barn, working on the VK-30’s plug. He added that some Cirrus employees own the company’s aircraft, but for those that don’t, he says flying Cirrus planes is easy enough to do. “We have a Cirrus flying club that has two SR20s; probably 100 or more Cirrus employees fly them,” he said. One of the company’s many partnerships is with start-up SATSair, a FAR Part 135 charter operator that uses Cirrus planes for its new air-taxi service. Cirrus owns 21 percent of SATSair, which eventually hopes to take delivery of 100 Cirrus aircraft. Alan Klapmeier is confident SATSair founder and CEO Steve Hanvey will be able to complete the order for aircraft, as his company attracts more investors over the next 12 months or so. Alan said SATSair is growing quite successfully, and customer response has been good. The company’s investment in SATSair is a demonstration of its belief in the air-taxi concept. Cirrus led the way for technically advanced aircraft in the GA industry, with its usable primary flight display. Because of these advances, the company’s planes are also used to train professional Part 121 pilots. “Future airline pilots will learn to fly with what we now call glass cockpits: PFDs and MFDs (multi-function displays),” Alan said. “I think we had a lot to do with making that the standard expectation of how people will learn to fly, rather than some high-end option they’d learn about later in their careers. I think that 100 years from now, people will look back at the primary flight display—the information display in the cockpit—and say it was the single most important change in the industry—the piece of technology that caused the industry to grow again. This photo of the Klapmeier brothers, taken in Cirrus Design’s infancy, shows a rare sight—Alan Klapmeier sporting a mustache. 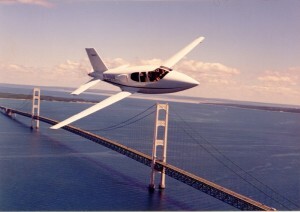 A large part of the company’s reputation for safety comes from the inventive, well-tested Cirrus Airframe Parachute System, manufactured by BRS Inc., based in Minnesota. The Klapmeiers had been exploring ways to make their planes as safe as possible and were enthusiastic about adding a parachute system to their aircraft. BRS was excited about the idea of manufacturing aircraft with a standard parachute deployment system. 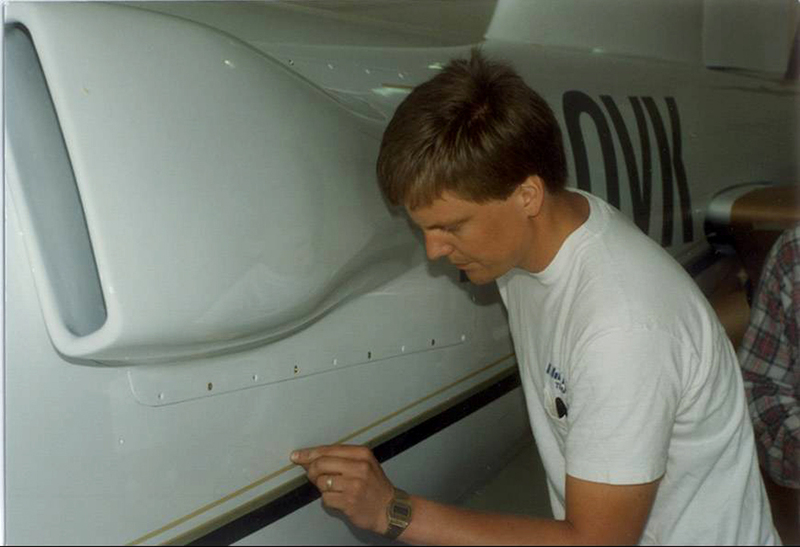 Dale said that when they first started the process to certify the SR20, they explained the airplane’s performance to BRS. Testing of the company’s parachute system began in 1997. Today, a 2,500-square-foot overhead parachute is standard on all Cirrus airplanes, but getting there was more complex than what the brothers first anticipated. Dale said the first three drops didn’t go as planned. The VK-30 launched Cirrus Design’s success. He said the parachute had to prove much more. After they had a canopy that worked, they then had to figure out how to get it in the airplane. “And we had to know how to get it out of the airplane,” Alan said. Dale explained that from the first drawing, the entire airplane was designed around having a parachute in it, down to how strong the engine mount had to be. Dale says their parachute system worked well in that it was designed, from the beginning, so that the empty weight would be equivalent to any other airplane of that size and performance. It took five months to compete those eight tests. According to Dale, it took four years to perfect the entire process. Alan says that neither he nor Dale were ever in the desert as flight tests were being preformed. They credit the company’s hardworking test pilots and engineers for risking their lives and making it work. The next aspect was the seat design. The seats underwent testing for two years. 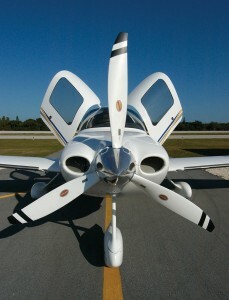 The SR22’s colossal doors make it easy to get in and out of the aircraft. 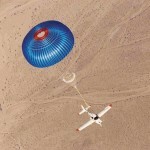 When Cirrus certified its SR20 in 1998, the company became the only GA manufacturer in the world to offer a rocket-deployed airframe parachute as a standard feature. In 2002, for the first time in history, a certified aircraft landed via parachute, and the pilot walked away uninjured. Because the brothers were willing to invest more than $10 million developing CAPS, 21 lives have been saved, involving nine chute pulls. Alan said only one fatality has occurred with a chute pull, when a pilot became incapacitated with three passengers on board. Although the pilot was dying, the pilot’s son was able to pull the chute, saving his life and that of two other passengers. He also has a personal inspiration for the use of a parachute recovery system. In 1985, he had a midair collision that nearly cost him his life. He had been flying his father’s Cessna 182 RG with his instructor, working on his instrument rating. Although the collision was horrific, Alan said he never considered giving up flying. Other incidents have given Alan pause. “On three occasions, which could’ve been fatal, I would’ve used a parachute if I’d had one,” he said. Between 1989 and 1992, Alan and Dale frequently discussed having a parachute recovery system. Alan remembers thinking at a young age that flying could be very dangerous. These experiences made him even more determined to make sure CAPS got off the ground. Dale agreed. Alan says parachutes will soon become a normally accepted standard in airplanes. Alan says he does wear a parachute when flying his 1951 de Havilland Chipmunk, which he flies about 25 hours a year. Some people have said that if Cirrus aircraft need parachutes, those aircraft must be dangerous. He says a new criticism is that a parachute encourages the pilot to do things that are dangerous. The company’s latest project is The Jet by Cirrus. Both brothers have a strong belief in the new product’s viability. “The Jet by Cirrus” name came from discussions within Cirrus. Dale commented that the name “SR20” was just an engineering designation. “It was going to have an actual name before it came out,” he said. Cirrus Design’s team of engineers is already hard at work on The Jet. “We’re hiring more engineers as we speak,” Alan said. Alan says the aircraft will have more than four seats, but the company’s still not giving out many details. Alan said that it’s not good to have a product that’s very fast, if none of the customers are comfortable flying it. He said “ease of operation” is essential. “It’s more than just comfort,” he said. “This airplane goes way beyond that. When we came out with the SR20 and the SR22, we differed from everybody else in the industry. Now, the industry is moving towards our position. We didn’t design the airplane only around the person in the left seat. He said passengers must have a relationship with that person in the front left seat and shouldn’t be walled off. Alan and Dale’s business relationship is one of aviation’s few true partnerships, despite their innate differences. “It means not accepting how things are done, but looking at what could be—what more people would like, what more people could fly, what more people could do,” he explained. He says Dale is more practical—”unbelievably practical,” in fact. But somehow, it works for the two of them. Alan and Dale are close, but, like most siblings, they don’t always agree. “We disagree about almost everything, but I’m always right!” laughs Alan wholeheartedly. Dale says Alan claims he’s always right. “Sometimes it just takes him a little longer to become right,” he laughs. “The way I say it is, ‘I’m never wrong for long.’ If I’m wrong, I want to be on the right side,” he smiles. Dale says they definitely fight and disagree, but he knows at the end of the day they’re on the same side. Becoming serious, Alan explains how he and Dale resolve their differing opinions. “First, we each try to convince the other that he’s wrong,” he said. “And then we yell for a while. Eventually, we give in to whoever feels the most passionate about the argument. I might assume, at some point, ‘Dale feels really strongly about this, so he’s thought about it more than I have, and, odds are, he’s right.’ That’s not the same as agreeing. Alan says that if one of them gives in, and it turns out to be the wrong decision, they’ll stick together, knowing that it was a decision they made together for the company. Beyond any of their decision-making methods, the root of their business sense is their dedication to aviation. Alan said what they really want to do is accomplish both. Dale further elaborated on the complex relationship between design and function. According to Dale, designing an airplane is a compromise. Both brothers believe pilots should be secure in their mastery of the machine and relaxed among controls, as extensions of their senses. The brothers’ success doesn’t always fit with their appearance. People have often told Alan that he doesn’t fit the typical CEO stereotype. He said he’s often mistaken for a Cirrus demo pilot—which is partly true; he’s been known to occasionally surprise potential customers with demo flights. Dale, who spends much of his time overseeing the nuts and bolts of the business, says he’s no tie-wearing executive either. For many years, he rode to work on his black Harley-Davidson motorcycle. But he’s moved on. But Dale couldn’t afford a Harley until the mid-1990s. Although he’s been known to punch it on sport bikes, his Harley and snowmobiles, Dale is more conservative in the Corvette. Today, Alan and Dale remain active pilots; Alan has approximately 5,000 total flight hours under his belt and flies about 400 hours a year, while Dale has about 3,500 hours. Alan flies several times a week, and 99 percent of the time, it’s in his Cirrus SR22. Although Alan is hooked on his 3,000th signature edition SR22-GTS, he’s excited about the performance of the SR22-GTS Turbo. While Dale can often be found tooling around Duluth in his red Corvette, he makes time at least once a week to fly, often to the family farm. He’s also been known to speed through a thick Midwestern snowstorm on a snowmobile, a hobby both men are enthusiastic about. “As for all the toys, I always say, ‘You can take everything away—take the boats, the cars and the motorcycles—just don’t ever take my snowmobile! '” Dale laughed. For Alan, the thrill pertains to both snowmobiles and airplanes. Merging his professional aviation career with the snowmobiling hobby isn’t a challenge for Dale. He had a goal to design a plane that his wife would choose, over driving. He’s pleased to say that he’s accomplished that goal. “If we can’t fly, we don’t go,” Dale said. 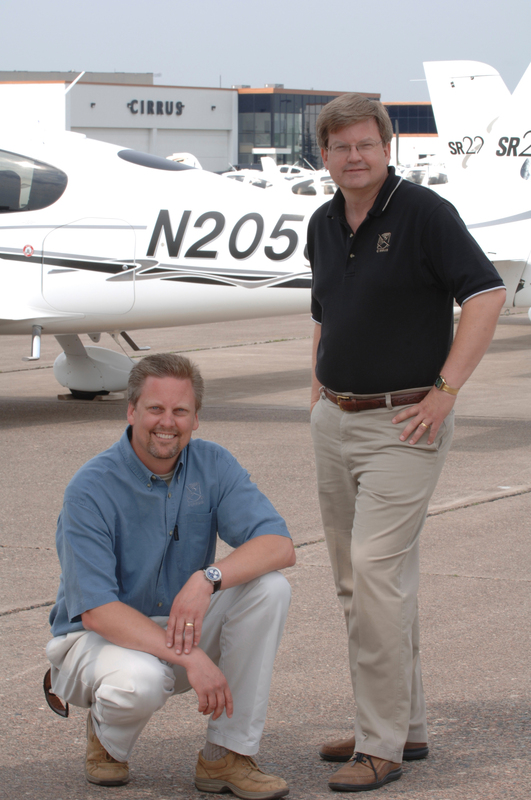 The brothers’ success came, in large part, from their in-depth understanding of the general aviation world. Alan said he and his brother identified a market they understand. “We came up with a concept of a product that would fulfill that market need, but it was important that we grew a team that was motivated to work on that,” he said. Alan says the entire Cirrus team deserves the credit heaped upon the company. Important team members include Paul Johnston, the engineering manager; Gary Black, the regional sales director; and particularly the production team under David Coleal, the company’s COO and president. Customers recognize that dedication. Recently, the CEO of a number of companies, along with his wife, who runs a major food company, came to take delivery of their airplane. The couple brought about 1,500 bags of cookies for everybody in the company. People say all sorts of things about Cirrus these days, now that the company has proved it could create one of the world’s most flexible, robust and easy-to-fly airplanes. Alan says that people now tell him, “We knew you could do it,” and “It was obvious that this could be done.” Those comments are different than the ones he remembers from those early days. Alan said they have three number-one priorities. For more information, visit [http://www.cirrusdesign.com]. 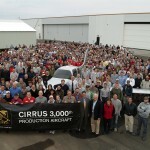 Cirrus employees pose for a historical photo in November 2006, during a recent ceremony celebrating the company’s 3,000th production aircraft. The SR22-GTS cockpit, specifically designed for pilot comfort, includes state-of-the-art avionics that respond intuitively, making the aircraft easy to fly. The SR22-GTS model, which debuted several years ago, comes fully loaded with almost every imaginable upgrade. Dale (left) and Alan Klapmeier pose in front of Cirrus Design’s 1,000th production aircraft sold. Deploying the Cirrus Airframe Parachute System, manufactured by BRS, Inc., has saved 21 lives, with nine chute pulls. The parachute lowers the plane and its passengers safely to the ground.